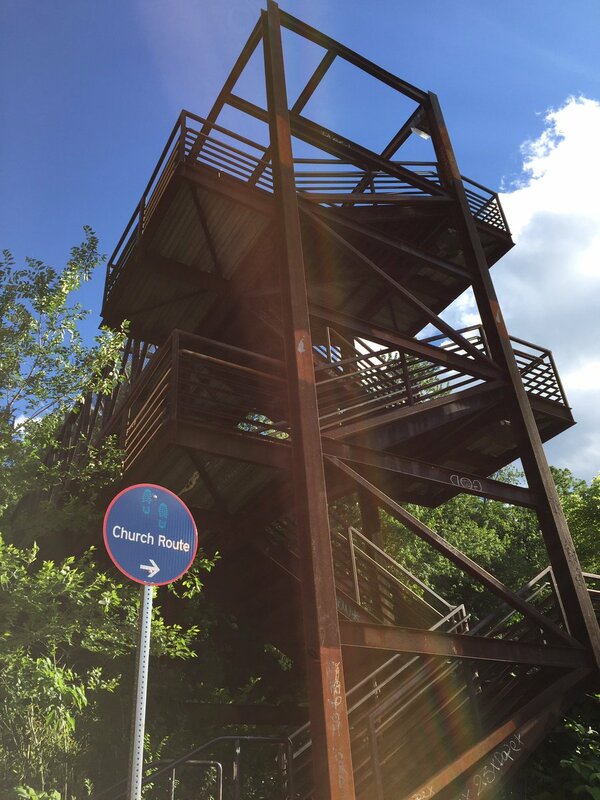 The South Side Slopes Neighborhood Association (SSSNA) is excited to announce the installation of signs marking the “Church Route” through the South Side Slopes. 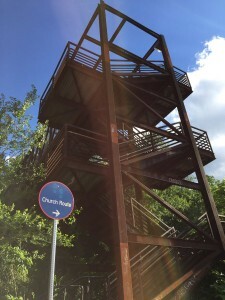 The Church Route is a walking tour that goes up and down our unique stairways providing beautiful views of the city, and featuring glimpses of the eccentric hillside architecture and historic churches. For 10 years this route was a part of the SSSNA’s annual StepTrek but the association decided to formalize the route into a permanently signed walk instead. Funding for the signage was provided by the SSSNA in partnership with the City of Pittsburgh, who manufactured and installed the wayfinding signs. The signs are posted at intersections leading from the start of the route at 15th and E. Carson Streets. The Church Route travels up 15th Street eventually ascending many different stairways and adjacent to the historical church of the Slopes. St. Adalabert’s, St. Michael’s, St. Paul’s, and St. Josephat’s churches are highlights of the trip, along with several stunning views of the city and the streets made of stairways. In keeping with the tradition of StepTrek, an annual tour of two different courses up and down the South Side Slopes, a narrative of the route is provided on the website here: http://www.southsideslopes.org/steptrek/church-route. A brochure with a map and helpful navigation information will be printed this summer, and will be available at the South Side Chamber of Commerce office on 11th and Carson Streets. In addition to a map, the brochure will provide historical anecdotes about the churches and community as well ongoing improvements and changes to the neighborhood. This entry was posted in in the news, News, Projects, StepTrek. Bookmark the permalink.